A balanced diet contains food from all five major food groups – meat, fish and other proteins; cereals, grains and other starchy foods; fruit and vegetables; dairy; and foods high in sugar or fat. The Food Standards Agency suggests that about a third of the diet should be fruit and vegetables, a third starchy foods like rice and potatoes, and a third split between proteins (meat, fish, eggs and pulses) and dairy products, with just small amounts of foods high in fats or sugars. Meat, fish, eggs, nuts, seeds, beans and pulses are excellent sources of proteins, as well as providing vitamins and minerals. Proteins from meat and fish are sometimes known as complete proteins, as they contain all the amino acids (the building blocks that make up proteins) that the body needs. Proteins from plant sources are ‘incomplete’, because they do not provide all the amino acids, but by combining proteins from the three groups of legumes (peas and beans), grains, and nuts and seeds, this creates ‘complete’ proteins – for example, beans on toast, or rice cakes with peanut butter. Meat provides iron in an easily absorbable form, and beans and pulses are a good source of fibre. 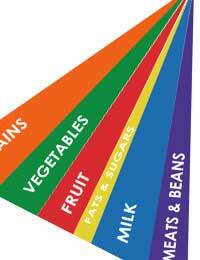 Cereals, grains and starchy vegetables supply energy, vitamins, minerals and fibre. These include bread, potatoes, rice, pasta and other grains such as quinoa and millet. It’s best to choose wholegrain versions of these, as they are absorbed more slowly, and supply more vitamins, minerals and fibre. Eating five portions of fruit and vegetables a day (including fresh, frozen, canned and dried vegetables, fruit and fruit juice) is important for health, because fruit and vegetables supply vitamins, minerals, antioxidants and fibre, and eating plenty can reduce the risk of heart disease, some cancers and stroke. Fruit is a great low calorie snack, and is a good replacement for sweets, cakes or biscuits. Dairy foods, including milk, cheese and yogurt, are a good source of calcium (important for teeth and bones) and provide protein and vitamins as well. Children should have full fat milk until two years old, but can move to semi-skimmed milk when they are five. Children do need more fat in their diet than adults do. Babies and toddlers can have up to 40% of their calories as fat, and children and teenagers up to 35%. Good sources of fat are eggs, cheese, full fat milk, meat, oily fish, nuts, seeds and avocados. Children, like adults, should avoid too much saturated fat, but some, such as cream or butter, is fine as a treat. For their size, children do need more calories than adults do, but it’s a good idea not to allow too much refined sugar in their diet (though everyone needs a treat sometimes). The Food Standards Agency has designed something called ‘the eatwell plate’. This is a picture of a plate showing the proportions of the different food groups for a balanced diet, and may help in working out the balance for each meal.